Home » Blog » Visit Everest Base Camp. Visitors Can explore an Old and ancient temple and monastery. Stunning views of many peaks ans gorgeous mountain including the Mt. Everest, World highest peak. Accent Kalapatthar is the best view point of Mt. Everest is the life time achievement during your visit Everest base camp. When to Visit Everest Base Camp? Everest Base camp is in altitude of 5350 Meters up from the sea level. Due to the high elevation trekkers must ready and prepare for prevent the cold. Middle of December to End of February is the coldest season in Nepal (winter) so in this time of the year is not very enjoyable to due to the cold. March, April and May, this three moth is summer period of Nepal, Great views, sun shinning and not very cold as winter so this moth is best for the Visit Everest Base camp. 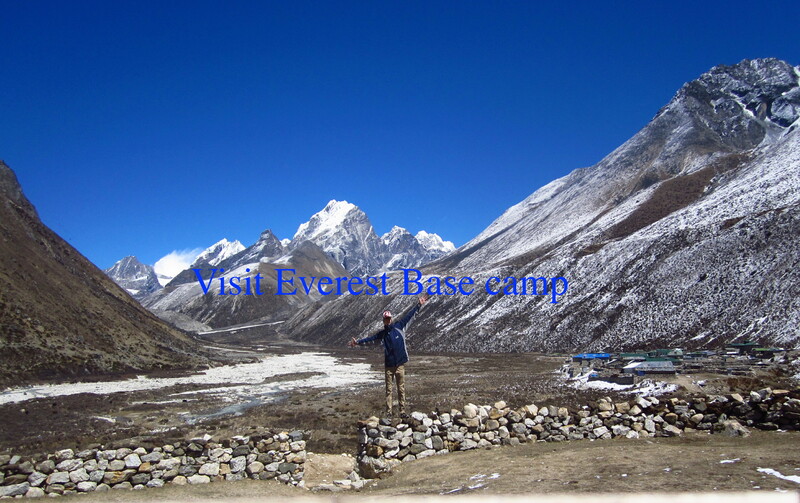 This time of the year is an excellent period for the to Visit Everest Base camp. Raining season has been just over washed all dust, Looks clean as well as green. The Sky is clear, Neither hot nor cold. Views are stunning, Beast weather, this time of the year is the superb period to Visit Everest Base camp. Can I visit Everest Base camp by road transport? 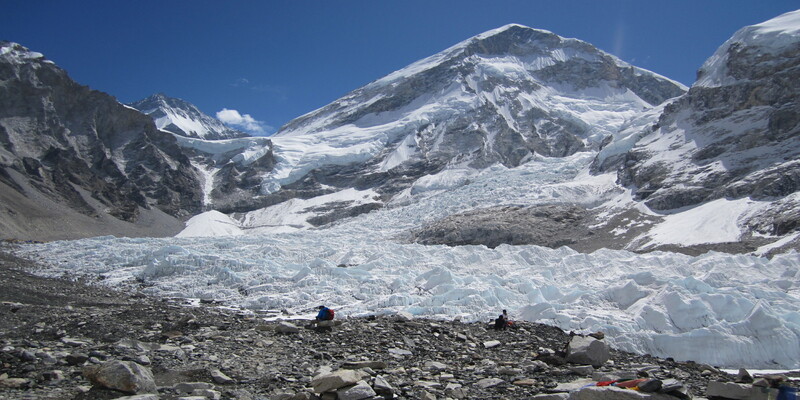 Everest base camp is approximately 65 KM each way from Luka after we Fly from Kathmandu. If we wish to Visit Everest base camp, we must around 11 to 14 days from Lukla to Lukla, there is no vehicle road access is available to vest Everest Base camp, Visitors must follow the trekking train to visit Everest Base camp. It means from more or less 130 KM to trek for both way. Travelers who they do not have enough time but wish to visit Everest Base camp can also visit by Helicopter ride from Kathmandu. This total flight takes around 4 Hours including landing time, This B-3 strong Helicopter fly over the Everest ranges and land in to near by Kalapatthar which is the best view point of Mount Everest. Up on request can also lands near the Mt. Everest base camp. Can be also possible with the group joining and private trip every day. Trekkers has two option to visit Everest Base camp, either fly to Lukla from Kathmandu or take a bus / Jeep ride to Jiri / Shivalaya. Taking a flight to Lukla take 11 to 13 days from Kathmandu to Kathmandu and driving to Jiri / Shivalaya take 4 to 5 days more for the same trek. Permit and paper for visit Everest Base camp. To visit Everest base camp (Everest Base trek) we need to issue Sagarmatha National park permit. We can issue this permit on the way to Namche. TIMS ( trekkers information system ) is also require however since Khumbu village committee has been started to collect the local tax with every trekkers from October 01, 2017, TIMS is not checking strictly. How Difficult to visit The Everest Base camp? Hikers ages like 15 to 65 around , normal shapes and sizes have completed the Everest Base camp trek Every year with a slight bit of training will find that almost anyone can overcome to the Everest Base camp trek. The Everest Base Camp Trek do not require technical skill or mountaineering tanning whatsoever as it is basically a long hike at altitude. Day 01: Fly from Kathmandu to Lukla (2860m) Then trek to Monzo. (2804m), 10 KM Approx. Day 02: Trek from Monzo to Namche Bazaar. (3445m), 4 KM Approx. Day 03: Namche Bazaar rest and acclimatization. Day 04: Trek from Namche Bazaar to Tengboche (3850m), 9.5 KM Approx. Day 05: Trek from Tengboche to Dingboche (4350m) 11 KM Approx. Day 06: Trek from Dingboche to Lobuche (4950m). 11 KM Approx. Day 07: Trek from Lobuche to Ghorakshep (5160m). Trek to Everest Base camp 5,380 m (17,600 ft) and down to Ghorakshep. 15 KM Approx. Day 08: Trek from Gorak Shep to Kalapathar (5555m). Trek down to Phireche, 13 KM Approx. Day 11: Trek from Manjoo to Lukla. Short Summary of visit Everest base camp. The most important things to visit Everest Base camp during the peak season that visitors must have to book their flight ticket to Lukla, Flight to Lukla is also hard to get the seat, Flight are full in advance for these peak season, getting first or second flight is most important, some time even in peak season m very often the flight cancel or delay dut to the wind and fog which is a remote area flight.